Steel Anti-Vandal 7v7 football Goals for junior football. Market leading safety and Innovation in football goal post design. A totally secure fixed position steel 7v7 junior football goal. A steel 76mm diameter post with a locked crossbar that is impossible to be lifted out and removed without the key holder’s consent. This is a patented concept and only available from ITSA GOAL. Do not be misled by heavy duty anti-vandal claims from other goalpost manufacturers. These are the only anti-vandal anti-theft goalpost available. The first choice of local councils all over the U.K. 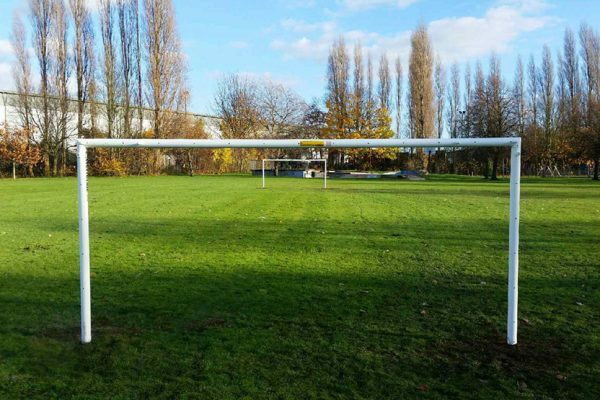 These steel fixed position goalposts cannot be stolen, lifted out intact or have crossbars removed by vandals. A safe and fast system that offers total security and accountability. A football goal that offers much more than other goal manufacturers basic products that just drop into the ground sockets. Uprights with bent bits of steel at the bottom can lock in uprights but as the crossbars are fitted with bolts anyone with a basic spanner can remover the goalposts. This can not happen with our Patented anti-vandal goal as the uprights and crossbars are locked in place and can only be removed with the use of a high-security key. The crossbars and laser cut uprights are identical and are fully interchangeable and are easier to store and use. 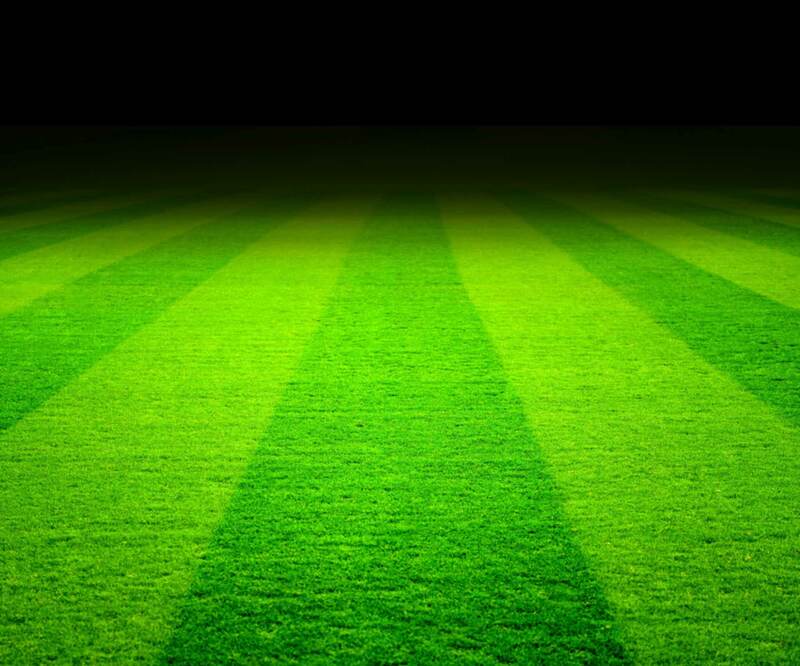 Designed specifically for local authorities who have numerous uprights and crossbars on multiple pitches. The crossbar is strengthened to meet the current safety standards and crossbar corners are CNC machined and are electroplated to help protect against corrosion. These corners are the strongest of any metal football goal and are designed to take the most vigorous use. Unlike other steel football goalposts, these goals have industrial nylon patented Arrowhead net fixings on the rear of the crossbar and uprights These make for a professional looking goal that allows nets to be fitted quickly and easily on match days. They also help extend the life of the paintwork as goal nets do not need to be pulled around the front of the posts and clipped. Safety net pegs that do not damage grass cutting machinery are supplied with every goalpost. Another new innovation is the way the net supports are secured to the crossbar allowing as much tension for the net head cord as you want . (no more net supports bending inwards as soon as you tension them) The net supports are designed so that they can be left in position on the goal frame or alternatively they can be easily removed after each game with the goal nets. (ideal for exposed positions) This additional feature helps prevent vandals from climbing on the goal frame. 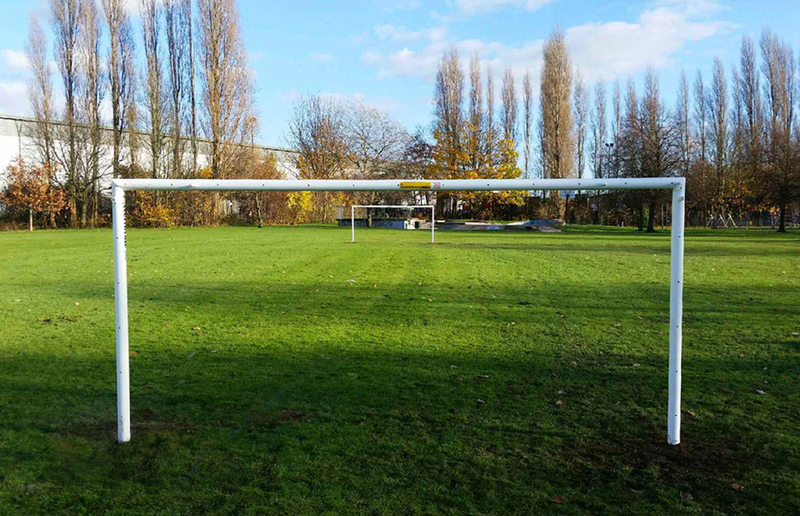 The anti-vandal goal post is fast becoming the preferred choice for local and district councils with exposed football grounds. The goals come with standard plastic ground socket caps but for local authorities or exposed sites flush locking ground socket plugs are also available (at extra cost) which fill in and secure the ground sockets in the close season. This is the best locking secure ground socket available anywhere. These football goals may be a little more expensive at the outset but are well worth the investment. The best online price for these Steel Football Goals is currently at www.soccertackle.com. £460.99p inc VAT click to buy online.